I’ll update this as I read the S1 prospectus. 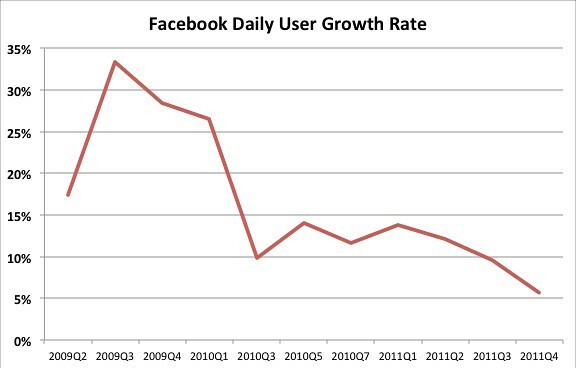 Facebook’s daily user growth is slowing. While 6-10% growth per quarter feels like a lot when annualized, it is getting close to being a normal company. Facebook is running out of target market, and especially target market with pockets deep enough to be monetised. The monthly active user chart is falling harder, and explains why I keep getting those annoying “Lance, you have notifications pending” emails. They are trying hard to keep these numbers afloat. The Summary Risk Factors deserves reading and thought. Be warned. This is the principal risk. If users migrate to Twitter and other platforms as Facebook follows in the footsteps of MySpace, Friendster and Bebo into uncool obscurity then the house of cards falls apart. Nobody can say what users will do, but the charts above should be hte most closely watched, as well as the amont of time users are engaging. This is the second biggest risk, though I would characterize it as a loss of ability to grow first, and the loss of current income levels second. 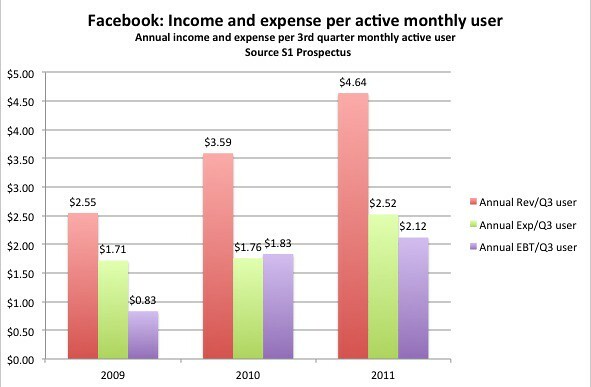 Facebook is free, and so advertising is the primary way to make money. There is a strong tension between getting revenue from ads and the quality of the user experience. A lousier user experience means people will migrate to other platforms. As Facebook is going public the pressure will be on to ever-increase revenue, wich in turn means more advertisements and in turn means a lousier user experience. It’s a tough circle to play in. Apple and Google could make things hard for Facebook on iOS and Android if they so choose, and they may do so. Facebook makes 17% of revenue from clipping the ticket on payments for virtual games. How sustainable is that? Privacy is still a major concern for FB. I’m actually ok with this, as it hopefully means decisions will be made with respect to usability and long term sustainability rather than quarterly reporting. We shall see. SOPA and other draconian legislation ideas could have a real impact on Facebook. However having Facebook as a large listed company will increase their voice on the Hill.The question is how they will lobby. Put that in the valuation models. Substantial blocks of our total outstanding shares may be sold into the market as “lock-up” periods end, as further described in “Shares Eligible for Future Sale.” If there are substantial sales of shares of our common stock, the price of our Class A common stock could decline. This is going to be a rocky ride. What’s interesting is looking at these on a per user basis. 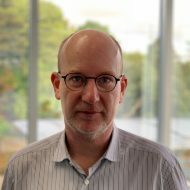 This is difficult to do as I don’t have the quarterly revenue figures to match with the monthly users, and even then we need to really get down to smaller periods so that the number of users is relatively static over the averaging period. In an attempt to get the weighted average I’m going with the end of 3rd quarter numbers of active daily users for this chart. Those users are worth about $8.12 each per annum right now. Most users are not active each day, and the average value of each of the people that checks Facebook at least once a month is just $2.12 per year. Let’s thinking about those numbers in practical terms. As a user Facebook makes money from you if you are exposed (weak) or click (strong) on advertisements and buy things (very strong), or if you partake in the many social games and pay money to the provider through Facebook’s payment system. The question to ask is how often people are clicking on advertisements, and hw effective they are. Facebook will be working hard to increase the effectiveness of advertising targeting, and on selling to adland, but ultimately the results are in our hands. The question to ask as you make a decision to invest or not is simple – how many regular customers will Facebook have, how long will they have them for, and how much money per year will each customer deliver. At the end of 2011 there were 483 million daily active users, and if we assume 6% growth for each of the next two quarters then 4% growth for the quarters after that then the Dec 31 2012 active daily users will be 587 million. The third quarter number would be 564 million. At the moment the gross revenue per active user (at the end of the third quarter) is $8.12, a 20% lift on 2010, which was almost 25% up on 2009. Let’s assume growth of 17%, whihc gives a nice round $9.50 per active end 3rd quarter user per year. That would mean total revenue of 564 million x $9.50 = $5.358 billion for 2012, 44% up on 2011. After that it gets interesting. 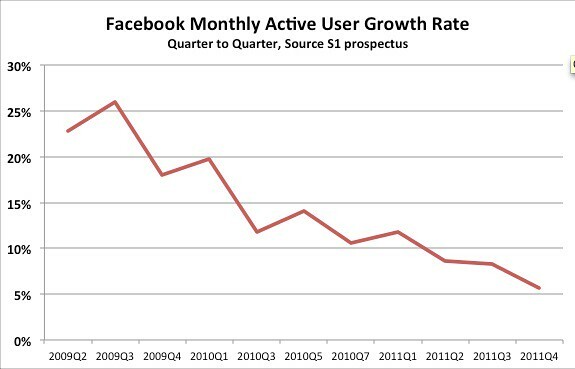 Will Facebook users actually keep climbing? Will the average revenue per user do the same? 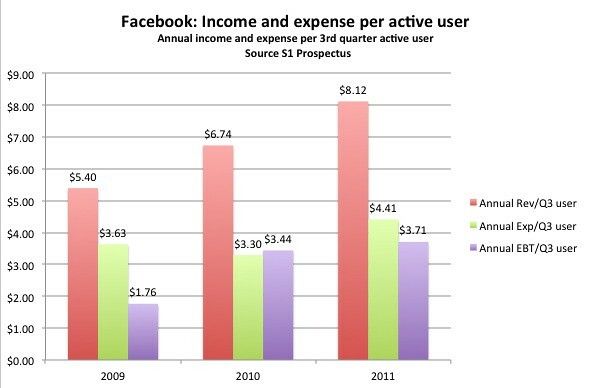 How good will Facebook be at controlling expenses, which climbed over 100% from 2010 to 2011? When it comes to valuing the company, think about the total amount of money that each active user will ever be worth Facebook. If active users were worth $10 each per year, then Facebook would need to keep 1 billion users for 10 years just to earn $100 billion in revenue. Subtract from that the expenses and the considerable time value of money, and we can see a large gulf when looking at hte $100 billion valuation. However if the average revenue per active user crept up to $25, then 1 billion of them would deliver $25 <edited typo> billion in revenue per year, and an easy $15 billion or so in net. That will take a few year to get to, but justifies a $100 billion value. So the questions to answer are simple: Can Facebook over double the number of daily active users, and Facebook over triple the dollars that each active user is worth to them each year. From my own experiences, dropping out of active Facebook participation and using blogging and Twitter only, I see this is very difficult. It seems hard to imagine higher penetration of Facebook in most Western markets, and there are portends of an early adopter migration to elsewhere, including Google +, Twitter or nowhere in particular. The expansion into new markets is also problematic as the average revenue per user will be lower in those lower income per capita areas. 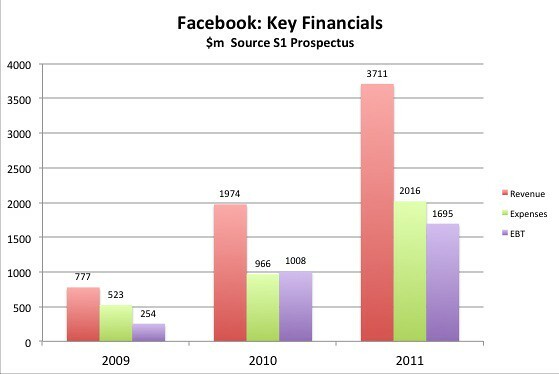 I wish Facebook luck with the IPO, it will be a good one, but I will not be investing. How important is Antarctica to the New Zealand Government? Immediately after reading this I went to my inbox, there were three press releases (I get them all the time in my work as a journalist). Two included links to Facebook pages. I’ve no idea why people in business think sending me to Facebook helps their cause, but there does seem a strong trend towards this at the moment. While I think you’re correct and smart users have already moved on from Facebook or have reduced engagement, companies and others seem to be using it more, presumably this more conservative audience is more lucrative. My guess is FB will turn in some respectable numbers in the short term, but fade quickly – possibly quicker than you think, Bebo and My Space collapsed almost over night. The IPO is at least a year too late to be attractive. I won’t be investing either. “Can Facebook over double the number of daily active users, and Facebook over triple the dollars that each active user is worth to them each year.” No they cant. I doubt that it’s in the prospectus but in my view the only way Facebook will significantly increase engagement with large numbers of users is if they can convert social usage to fb dollars that can be spent inside fb. Inventing your own currency is often attempted but not as easy as it sounds. Pinterest is where the cool kids have gone to and it will always be the same. There will always be a new /new thing to go to. Ironically using their fb or twitter login to do just that. I think we will see more hyper local online communities that will out perform fb in the longer term. Many users have a love/hate relationship with ads which are tolerated and mostly ignored by savvy users. With the fb personalised ads there has already been a backlash. Walled gardens like fb are not new. AOL failed and while geo-cities was a different beast it also failed. This list from the recent Myspace failure is very pertinent. 1. Consumers have long brand memories. 3. Perceived momentum = perceived value. 4. Change within large organizations must be centered around drastic actions. 5. Single front door = single point of failure.